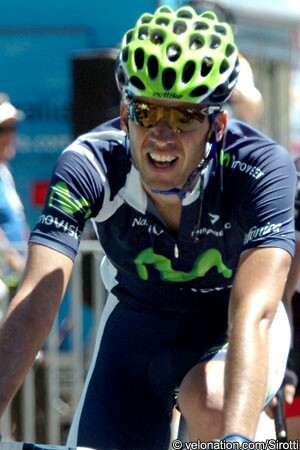 A year after helping Alejandro Valverde to second overall in the Santos Tour Down Under, Javi Moreno has emulated his team captain by doing precisely the same this time round. The Movistar rider took his best result to date in a stage race when he finished as runner-up in the Australian WorldTour event, ending the race seventeen seconds behind the overall victor Tom Jelte Slagter. Moreno’s success was based primarily on two performances; his second place behind Geraint Thomas on stage two to Rostrevor, and third yesterday at the summit of Old Willunga Hill. Those performances brought him close to winning the race, and also secured him the mountains classification. Moreno has achieved some solid results in the past, including overall victory in the 2011 Vuelta a Asturias and last year’s Vuelta a Castilla y Leon, but he considers his runner-up slot in Australia as a superior performance due to the fact that it is a WorldTour race. Part of his satisfaction is because he was named as designated team leader beforehand and was able to shoulder that responsibility well. “I spent two months preparing myself for this after I got told in the first team meeting I had to be fit for this race,” he said. “I don't know if I came at 100%, but I reached a very good level of form, partly because it was a good winter and neither injuries nor illnesses affected me. Sitting second overall in the UCI WorldTour is one way of doing so, and so too the fact that the team is third overall. Next up for Moreno is the Vuelta a Andalucia, Paris-Nice and the Volta ao Catalunya. He hopes to continue with the same strong condition he showed in Australia, and is fired up to move to a new level this season. And being 28 years of age, he should be coming into his prime.